We asked LBB users where they go to get the trendiest haircuts in Kolkata (all under INR 300!) and here’s what they recommend – you’ll never leave the salon in a cap, hiding a bad haircut ever again! Need a quick haircut before you catch a flight? Hair’s Evelyn is right near the airport so you can pop in here if you’re early for your flight. This unisex salon will give you a haircut at INR 200 but if you’re a loyal customer they give you a discount to INR 160. While the do accept card payments, its usually a slow process so if you’re in a hurry, then cash is the way to go. Skylark is synonymous with “school haircuts” and is where every school-going boy is dragged to on the last day of the summer holidays. Get a traditional haircut at just INR 90. You won’t miss their signature blue sign right next to HHI. Skip going on Tuesday, they’re closed. Open from 9 am right till 8 pm, get a trendy haircut at this tiny salon starting at INR 100. Located at the Park Circus-Park Street interface, the road outside is usually choc-a-block with traffic and parking is always full so it may be a better idea to come in a cab. Head here on any day except Sunday (it’s closed). 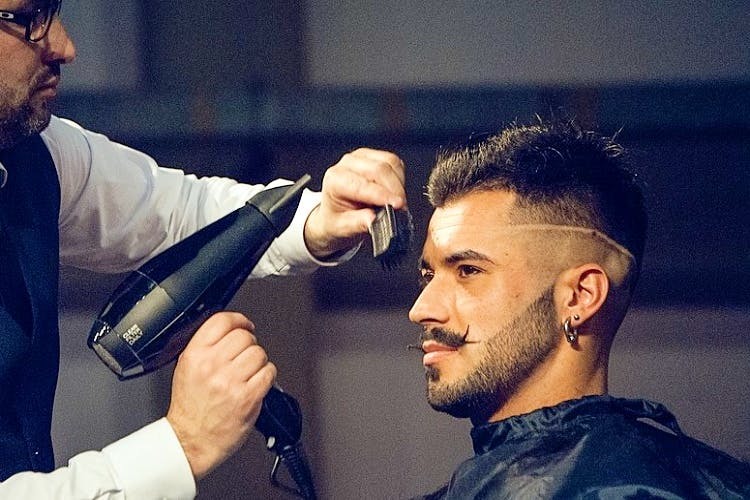 With multiple outlets across the city, if you want the coolest looks and the trendiest cuts, here is where you should head. A men’s haircut comes for INR 300+, although it’s a little on the steeper side they make an effort to listen to the kind of cut you want (no, they don’t hack off your hair if you just want a trim!). If you’re hesitant about someone new cutting your hair, ask for one of their senior stylists (they have more than 5 years of experience!). The 3 outlets of Cyber Tropicana give you a new look for just INR 300. This unisex salon makes your life really easy – all the outlets are very conveniently located, have parking and offer a range of other services (they even do hair weaving!) for men and women. Head down to Toppers to get some quality service (these guys are all about customer care) and will treat you really well. It’s unisex – the men’s and ladies’ sections are divided down the middle. A haircut will set you back INR 180+ depending on the style that you want. We know what you’re thinking – no, it’s not the famous biryani joint but you do get awesome biryani in the area (the salon is a stone’s throw away from Zeeshan!). Once you get over the super-brightly coloured walls (we’re talking hot pink and bright yellow) settle down to enjoy a haircut that’s costs just INR 80 when you get it without the shampoo. Don’t forget to carry cash!